Nationality. Wildblood is English although most people who hear it for the first time think it is Native American. In recent decades the blood has been "tamed" by marriage to persons of Welsh, Irish, Scottish, Dutch, Danish, Swedish, Swiss, Italian, German, French, Polish, Vietnamese and Arab birth or extraction. Since 2000 two Russian children have been adopted into the global tribe. It is suspected that the mother of three Wildbloods registered in Kensington and Chelsea in the first decade of the current millennium, whose maiden name is Silva, is Sri Lankan. Despite two black households in 19th century Louisiana and Mississippi censuses and lengthy stays of several families on the Dark Continent, apparently no African blood has been transfused to enliven our current blend. Most first names have been British and "Christian" - John, Elizabeth, Thomas, Sarah - but there has also been an Esron, Cinderella and Wenonah. Epicene, who formerly seasoned the list, is now about to be blown to Smith or Eeens under the grave, undenied suspicion of impersonating an offspring and parading unwarrantedly and unworthily as a wannabe Wildblood. Derivation and Earliest Records. Legend has it that the name denotes crime. That highway robbers were the first to be called Wildblood. The earliest Wildblood down under was hanged for murder soon after he arrived. People with the surname have gained prominence by coming down hard on both sides of the law, and in the 20th century have been convicted of forgery and since-decriminalized buggery, in the 21st of robbery and smuggling. The most ancient record of the name is from York Minster in the 13th century, followed by the transcriptions of 14th century monks bearing the seemingly pagan denomination. Family trees that the author has seen date back to the 1669 birth of Richardus to Thomas and Ellen in Smallwood and the 1727 delivery of Thomas by Alice, thought to have been a spinster, in Penkridge. Alice later married and had only daughters in wedlock. A few paragraphs down, under Research, Alice and her girls are immortalized in poem. Wildblood Square in Burslem has disappeared from the maps. However, the wild, woolly, snake-infested and overgrown Wildblood Branch creek still flows into the Pearl-bound Bogue Chitto. Maynard (left) and, to a greater extent, Christiana. Starting in 1649 a few Wildblood men ventured to the American colonies, but apparently died with no progeny. The first permanent settlement of Wildbloods in the New World added spice to Louisiana around 1840. The immigrants from Shropshire focused on West Feliciana Parish. Another family emigrated to Kent County, Ontario in 1864. Their descendants established a bridgehead in San Jose, California. Despite a 1912 settlement in Manitoba, by 2013 only one last Mohican remained in Canada. About 1858 five brothers, apparently born in Derbyshire, settled in Trenton, New Jersey, and East Liverpool, Ohio. A family from Staffordshire moved to Trenton in 1880. A handful of English Wildbloods emigrated to Australia and New Zealand and their families remain in Oceania. Presently, December 2013, there are about 250 bearers of this name in the UK, 60-70 in the U.S., one bachelor in Canada, two families in France, one each in Germany, Spain, Indonesia, Vietnam, Japan and Hong Kong. Occupations. Many of the earliest holders of the name were farmers, canal boatmen and coal miners. Potters predominated in the 19th century, particularly in Staffordshire, Trenton and East Liverpool. Numerous Wildbloods have been business owners and managers, bankers and Methodist ministers. Some of the most prominent Wildbloods of our era are educators, doctors, nurses, law enforcers, architects, an ex-Greenpeace sustainability manager and a former International Petroleum Exchange head. 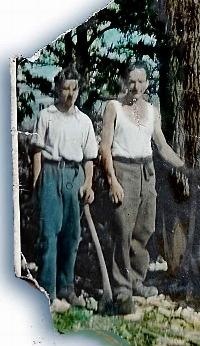 There have been realtors, construction managers, builders and landlords, translators, travel agents and guides, servants, butchers, electrical people, pet providers and attorneys, and here timbermen, John and Den, before the latter emigrated from the forests and sawmills in the borderlands of Wales and Shropshire. The photo was damaged by budgies, native to his native forests and Den's buddies on two continents. And recently a new line has been added to our vocational options. As of October 2006 one Wildblood is a long-range, intercontinental bouncer. Any resemblance of this respect figure to persons living or dead and found elsewhere on this page is not purely coincidental. His mother, an ocean away, says, "He is going at a rate of knots." Recreation. No dull boys or girls, the Wildbloods have participated in a wide variety of sports. Below a sample, and most likely only half of the disciplines have been covered, so please add some more muscular pastimes, names and places to the list. This site could picture you busting a bronc, roping a calf, putting for a bogie or sailing into a squall. Hunting of ducks in California and an not-quite identified H.S. in B.C. The above mostly reported on the Internet and mostly competitive. The Wildbloods in Germany are not particularly athletic, but the website author will hop over the net to boast that he has coaxed his wife into playing tennis in Belgium, France, Spain, Portugal, Italy, Germany, Czechia, Poland, Soviet Union, United States, Wales and Australia. The coaxing was tougher than the volleying. *Hard to find although the e-xplorer dug for hours; may be in Breconshire, which methinks is politically Powys. If anyone locates it, let me know, and I will cave in on this impure speculation. Religion. The overwhelming majority of Wildbloods are WASPs. In the Old Country most are Anglican and Methodist. Recently Wildbloods have been instumental in introducing a contemporary type of worship to the Church of England, with a Garage Praise group in Shropshire. The first Wildbloods in America were Episcopalians and Presbyterians. Today there are also Primitive and American Baptists, Lutherans, Catholics, Latter Day Saints, Jehovah's Witnesses and Bible Students (Antioch Ecclesia). A prominent Wildblood in the west of England was identified as a Buddhist in 2017. Variations. Today "Wildblood" is the near-exclusive spelling. One exception is Whileblood in East Yorkshire. Old documents show Whildblood, Wildeblood, Wildebloud and several others. One adult is known to have changed his name to Wildwood before his children were born. At least one woman linked her Wildblood maiden name to her husband’s with a hyphen. Publications. Books: What Makes Switzerland Tick, by Richard; and Leading From Within, by Peter; Against the Law, by Peter Wildeblood, Joybird by Rosemary. Journal articles on pediatric nursing by Ann and quality assurance by Sue. Fictional Characters. Wildblood’s Empire, sci-fi by Brian Stableford. Wild Blood, a werewolf genealogy (for the stout-hearted only) by Nancy Collins. Frederick Wildblood, a plagiarist fugitive to New Zealand in Maurice Shadbolt’s House of Strife. Leslie Wildblood in Roy App’s Best-Kept Gerbil Competition. Fred Roger John Wildblood, seen at home in Higher Heath, Shropshire in November 2007. 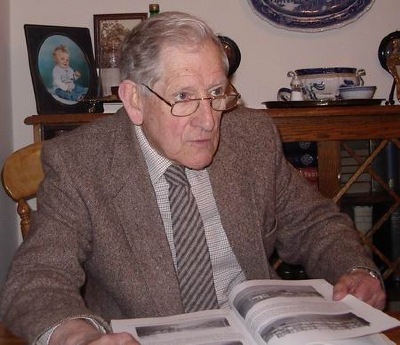 The Blythe Colour Works scion has been a local and family historian since childhood. The Pembroke College, Oxford, graduate has abundant records on Wildbloods in Salop, his native Staffordshire and Montgomeryshire, having lived all three counties. Roger's studies reach back to the late medieval days of non-conformist pastor Humphrey and pardoned murderer Hugh Wildblood. His transcriptions of hard-to-decipher ancient documents are copyrighted by the Diocese of Lichfield. This great storyteller has promised to put his findings in writing soon. Roger believes the Wildbloods originated in Staffordshire and were first introduced into Shropshire by trade, land ownership and marriage, especially during the 14th and 15th century lawlessness in the Marches. We are privileged to publish Roger's sonnet on the "single mother" of many of us. What were her hopes for them? How spoke her fears? “But patience long and privacy for woman’s tears. by Sharlie Stubbs an Ontario-raised Australian and Latter Day Saint on an ongoing mission; and by me, Alan Wildblood, a Berliner from New Jersey. If you want a look at me, my site is to behold. Family trees have also been compiled by Libba and Pam for Louisiana, Diane for Ohio, Peggy for California, and the late Alice for Shropshire. Most of the church records in Staffordshire and South Cheshire have been evaluated. The resources of the New Jersey State Archives have been exhausted, and much raw census data has been processed. In May 2006 Alan had just accessed 18 Wildblood World War I draft registrations and was trying to correlate the Wildbloods (and "Wildblows" et al.) from the 1901 England census with Charie's 1881 inventory. In October and November 2007 the same investigator tapped digitized versions of The Times, The (Manchester) Guardian, Leeds Mercury, Liverpool Mercury, Birmingham Daily Post, Staffordshire Sentinel for most of the 19th and 20th centuries and processed over 500 references to "Wildblood" and "Wildeblood." an all-Louisiana reunion was held on May 29, 2004 at St. Francisville. Attendees from as far off as Georgia and California swelled the sweltering crowd to about 100. Here Lloyd II of Beauregard meets distant cousin Gene of Jefferson Parish for the first time.